You’d be hard pushed to find a more iconic vehicle than the classic T2 campervan and it’s various successors and updated versions. For millions across the globe, it’s something of a dream car – one that represents a specific time in life and history, an important motoring landmark. Yet, many people know very little about the incredible VW Transporter’s history and origins. This article seeks to remedy that. The original idea and design concept for the T2 came from a Dutch Volkswagen importer named Ben Pon – when on a procurement trip to import a series of Volkswagen Type 1s (the classic Beetle), he had a stroke of genius and envisioned something else. His idea was essentially the basic, fundamental T2 design; that of moving the driver and his steering equipment to the very front of the car, and providing an elongated space at the back for storage. It quickly became apparent that the chassis and materials which were being used to produce the T1 in huge numbers, at the time, simply wouldn’t make the cut for the sort of design and style of the Transporter. However, it wasn’t until Volkswagen’s new CEO, Heinz Nordhoff, got involved – after a whole host of design tweaks, and the inclusion of aerodynamic testing and alterations on the T2 design – that the first, official Volkswagen T2 van was put into production. This was November 12th, 1949. From this point, mass production of the classic VW T2 steadily grew, and the overall design, style and mechanics remained the same for several decades to come. Little could Ben Pon have known what he had created with his original flash of motoring genius. 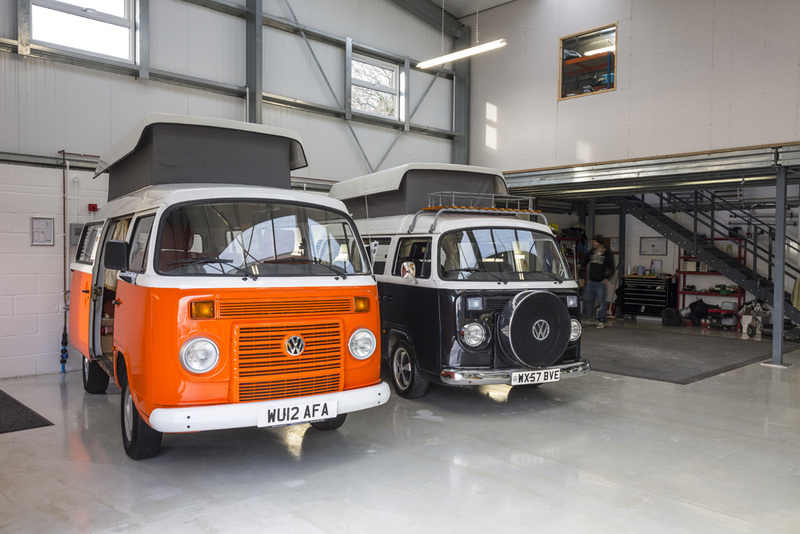 However, it would be a while yet before the T2 would be turned into campervan, as the first variations, throughout the 1950s were ambulances, fire engines, milk-floats, delivery vans, ice-cream vans etc. mostly utilitarian models to meet a specific purpose. Through the 1950s to the early 70s, the T2 evolved to our lasting memory of the VW camper. The early 1950s witnessed the first split windscreen vans, as well as the introduction of engine upgrades and the two-tone paint style. In its final few incarnations, the once unimpressive, functional T2 van became a symbol for the hippie generation, often boasting vibrant colourful paintwork. Accompanying the unified bay window upgrade, came the rounder body shape that we know today, away from the more boxy and squared-off design of older vans. It was this new model of T2 that Danbury, amongst other motorcaravan companies, chose to turn into a campervan and began converting en mass right up until the final days of production in 1979; before the inception of the post-T2 campervans that we have seen throughout the 80s, 90s and noughties. The modern VW Transporter has evolved into a stylish, versatile vehicle, but when it comes to reflecting the character and classic looks of yesteryear’s T2s, it can’t compete with a Brazilian Kombi!